The Abraham Dolehof is a commonly shared courtyard in the city center of Utrecht. This reminds me of the socio-historical fact that the courtyard garden used to be home to a real playground in the seventies. This has sparked the idea of examining the “playability” of this location with the project entitled Hop Hope Hof. It’s a course that consists of workshops for and by children, in which we jointly explore the possibilities of the Abraham Dolehof and strengthen our ties to the immediate neighbourhood. 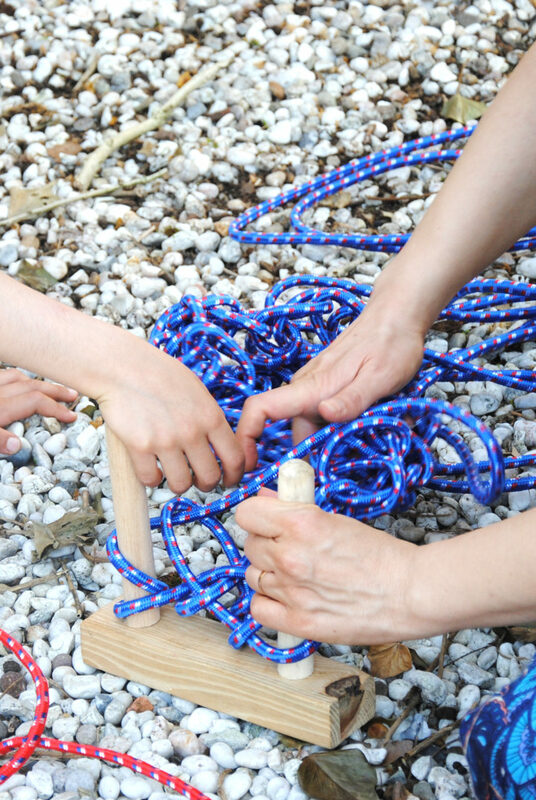 The program acts as a site for meeting and collaboration; it offers space for collectivity and the exchange of ideas; and it gives children the opportunity to invent their own forms of play, rules, and even toys. Ultimately, the results will be reflected in a Ludotheek—a public play library of which its members can rent or borrow shared toys, games and playspaces in the Abraham Dolehof and beyond. This project is part of the ongoing project ‘Play Perspectives.’ It’s a research into play, the commons and alternative pedagogy. It functions as a laboratory both stimulating playing together as well as reflecting on it. The participating children are invited to research the concepts of play and playgrounds in public space while playing. This manifests in workshops focused on drawing, building, mapping, playing, talking and interventions in public space in order to set a playful framework for the main principles of playing in the urban context of Utrecht. Inspired by Colin Ward’s The Child in the City (1978) this projects gives current children, instead of city planners or architects, the opportunity to reflect on (the history of) playgrounds in order to give them agency in formulating their vision and become play designers in their own right. What are their visions on play and public play space? What tactics are incorporated in this playful way of appropriating the city? Which embodied knowledge is situated in the children’s play? How do children play together to find a common ground for play in relation to the space they share? Can they function as a community of children imagining its own rules? During this program children reinvent and imagine principles of play in the urban space and reflecting on them. In a wider context the results of the children’s collaborative research offers perspectives on how structures of urban environment can be re-used and re-imagined. How can our cities become accessible for its young inhabitants? Which conditions can make our cities more pleasant to live in? Also, which social and aesthetics values are incorporated in the playing process?